Research by a University of Cincinnati classics professor sheds new light on the philosophy of the ancient Cynics. They actually held values they viewed as a shortcut to happiness. Research by the University of Cincinnati’s Susan Prince shows that despite the historical perception of the ancient Cynics as harsh, street-corner prophets relentlessly condemning all passersby and decrying society’s lack of virtue, these Greek philosophers, indirectly descended from Socratic teaching, weren’t all doom and gloom. They actually might have espoused a shortcut to happiness. Much of Prince’s work focuses on the individual believed to be the primary influence on the Cynic movement, Antisthenes. Antisthenes was a pupil of Socrates and occasional rival of Plato. In fact, while history occasionally paints Plato as a philosopher of unequaled wisdom, UC's Prince says that through study of his texts, it’s more plausible that he developed his ideas through tight intellectual debates with his contemporaries, and Antisthenes was among them. Plato and Antisthenes shared many beliefs in common with all philosophers – rejection of wealth and luxury, and embracing the pursuit of wisdom and virtue. But Antisthenes’ methods set him apart from Plato. Whereas Plato founded his Academy for philosophical teaching and lengthy study, Antisthenes advocated a short but rigorous path toward virtue and happiness. Antisthenes’ way was short in that he endorsed an abbreviated curriculum when compared to those of other schools of philosophy, which contended that the quick route was a road to nowhere. 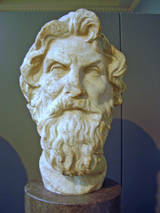 Antisthenes’ teachings skipped over the technical aspects of logic in order to concentrate on ethical literature, such as reading Homer. And Antisthenes’ way was rigorous in that it required a drastic attitude change. To follow the path of the Cynic was to abandon many societal conventions and to live in accord with nature – no more fancy clothes, no more exquisite feasts and even no more roof over your head. Through this shortcut, Prince says Cynics were able to gain leisure time which could be put toward living the good life or what Antisthenes called “seeing the things worth seeing and hearing the things worth hearing.” And that’s how an ancient Cynic could exist in ethical bliss until the end of his days. “You get to your happiness quickly and then you practice your happiness for the rest of your life,” Prince says. In a modern context, there’s some irony in the notion of a cynic devoted to the pursuit of happiness, and Prince hopes her research can clear the air on Antisthenes, et al. In addition to her paper for the Unisa conference, she has a 600-page manuscript on Antisthenes scheduled to be published through the University of Michigan Press in 2013 or 2014. She wants to show that the negative connotation associated with “cynic” might be historically inaccurate and to provide a little redemption for centuries of misjudgment. Rivalry or not, when looking into history’s rearview it seems as if Plato’s shadow has grown larger than it appeared, diminishing the contributions of others. Peter van Minnen, head of the Department of Classics in UC’s McMicken College of Arts & Sciences, thinks the Cynics have been under represented in the scope of Greek philosophers.